Youngstown - Helen M. Walas, 92 of Youngstown, died Wednesday morning April 3, 2019 at Park Vista Retirement Center in Youngstown. Helen was born January 13, 1927 in Chicago, IL, a daughter of Charles and Anna (Halper) Molnar. In 2014, she came to the Youngstown area after living many years in Evergreen Park, Illinois. Helen worked at Montgomery Ward in their catalog department and later worked as a ward secretary at Christ Hospital in Oak Lawn, Illinois. She later did volunteer work at the hospital for several years. Helen was a member of Heritage Presbyterian Church in Poland. She enjoyed bowling and playing games, especially Bunco and cards, but most of all, enjoyed spending time with her family. Her husband, Joseph Walas, whom she married in 1947, preceded her in death in 1975. She leaves two daughters, Jo Ann (James) Scherffius of San Jose, California and Margaret (Dr. John) Venglarcik of Poland; nine grandchildren, Jeffrey, Jill, Jessi, Carey, Sarah, Mary, Tom, Joe and Olesia; eleven great-grandchildren; and many nieces and nephews. Besides her parents and her husband, Helen was preceded in death by her son, Robert Walas; her sister, Dorothy Pertile, and her brother, Carl Molnar. 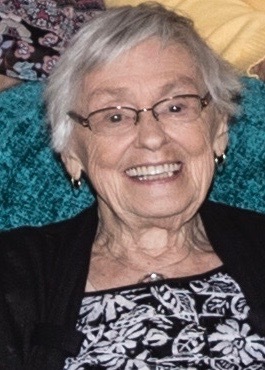 Services will be held at 11:00 a.m. Tuesday April 9, 2019 at the Heritage Presbyterian Church, 1951 Mathews Rd., with Reverend Terri Swain officiating. Friends may call prior to the services from 10-10:45 a.m. Interment will take place at Evergreen Cemetery, Evergreen Park, Illinois. In lieu of flowers, the family requests material contributions take the form of donations to the Heritage Presbyterian Church Music Fund, SouthernCare Hospice Services or the Park Vista Ohio Living Foundation. Arrangements are by the Davidson-Becker Funeral Home in Struthers.